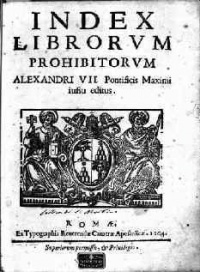 The Index Librorum Prohibitorum ("List of Prohibited Books") is a list of publications which the Catholic Church censored for being a danger to itself and the faith of its members. The various editions also contain the rules of the Church relating to the reading, selling and censorship of books. The aim of the list was to prevent the reading of immoral books or works containing theological errors and to prevent the corruption of the faithful. Theology finds its scholars pursuing the understanding of and providing reasoned discourse of religion, spirituality and God or the gods. Theology and religious studies are sometimes seen as being in tension; they are sometimes held to coexist without serious tension; and it is sometimes denied that there is as clear a boundary between them as the brief description here suggests. Whether or not reasoned discussion about the divine is possible has long been a point of contention. As early as the fifth century BC, Protagoras, who is reputed to have been exiled from Athens because of his agnosticism about the existence of the gods, said that "Concerning the gods I cannot know either that they exist or that they do not exist, or what form they might have, for there is much to prevent one's knowing: the obscurity of the subject and the shortness of man's life." In his two part Age of Reason, the American revolutionary Thomas Paine, wrote, "The study of theology, as it stands in Christian churches, is the study of nothing; it is founded on nothing; it rests on no principles; it proceeds by no authorities; it has no data; it can demonstrate nothing; and it admits of no conclusion. Not anything can be studied as a science, without our being in possession of the principles upon which it is founded; and as this is the case with Christian theology, it is therefore the study of nothing." The atheist philosopher Ludwig Feuerbach sought to dissolve theology in his work Principles of the Philosophy of the Future: "The task of the modern era was the realization and humanization of God - the transformation and dissolution of theology into anthropology." 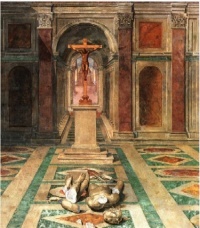 This mirrored his earlier work The Essence of Christianity (pub. 1841), for which he was banned from teaching in Germany, in which he had said that theology was a "web of contradictions and delusions". In his essay "Critique of Ethics and Theology" the logical-positivist A.J. Ayer sought to show that all statements about the divine are nonsensical and any divine-attribute is unprovable. He wrote: "It is now generally admitted, at any rate by philosophers, that the existence of a being having the attributes which define the god of any non-animistic religion cannot be demonstratively proved... [A]ll utterances about the nature of God are nonsensical." In his essay, "Against Theology", the philosopher Walter Kaufmann sought to differentiate theology from religion in general. "Theology, of course, is not religion; and a great deal of religion is emphatically anti-theological... An attack on theology, therefore, should not be taken as necessarily involving an attack on religion. Religion can be, and often has been, untheological or even anti-theological." However, Kaufmann found that "Christianity is inescapably a theological religion". Sola fide or "Justification by faith"
Unless indicated otherwise, the text in this article is either based on Wikipedia article "Theology" or another language Wikipedia page thereof used under the terms of the GNU Free Documentation License; or on original research by Jahsonic and friends. See Art and Popular Culture's copyright notice. This page was last modified 07:37, 11 February 2014. This page has been accessed 8,419 times.